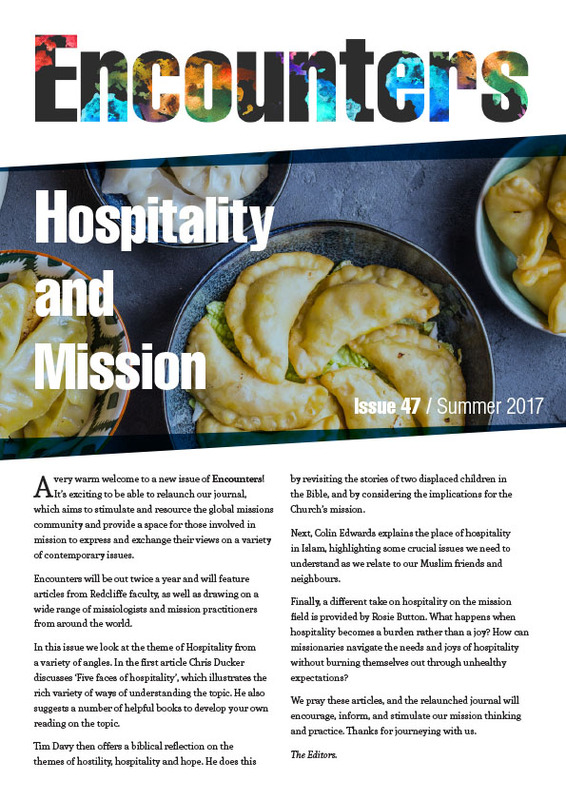 This edition of Encounters re-presents the papers read and discussed at a conference held at Redcliffe College in April of this year (2008). The title of the conference Growing Asian Mission Movements: Issues and Models for Partnership speaks for itself. Pride of place goes to Dr Patrick Fung’s magisterial presentation on the contemporary situation in China, China and Beyond: Issues, Trends and Opportunities (Article 1). As General Director of OMF International and a regular visitor to China, Dr Fung knows what he is talking about! As I said in my Conference response the lecture was a wonderful mixture of statistical analysis and personal experience. The overall theme of the conference was ‘partnership’. Robin Thomson looked at this from a South Asian perspective (Article 2) and Kang San Tang took as his starting point the spectacular growth of missions from East Asia and the implications for partnership with the West (Article 3). Patrick Fung provided some practical models of partnership in the Asian context and drew some theological and practical conclusions (Article 4) and Mark Oxbrow responded to the whole concept of partnership drawing on his own valuable experience in this field (Article 5). Jonathan Ingleby’s response to the Conference – largely a plea for yet more research and reflection – is also included (Article 6). As a fascinating additional contribution to the overall Asian complexion of this edition there is an article on Shusaku Endo’s Silence, one of the most challenging books for the ethics of mission ever written (Article 7). With a useful selection of book reviews, I think I can safely recommend this edition of Encounters to you. China and Beyond: Issues, Trends and Opportunities – The Redcliffe Lecture in World Christianity, 2008. Asian Mission Movements from South Asian Contexts. Who is in the Driver’s Seat? A critique of mission partnership models between Western missions and East Asian mission movements. Mission Asia: Practical Models in Mission Partnership – a summary. Mission in Partnership: A Response. Reflections on a Conference: Putting partnership at the top of the agenda. A Dilemma for Obedience: An analysis of Japanese Christian Ethics in Silence by Shusaku Endo. Book Review 1: Just Walk With Me: A True Story of Inner-City Youth Work. Book Review 2: The New Conspirators: Creating the Future One Mustard Seed at a Time by Tom Sine. (by Tom Sine; Inter-Varsity Press, USA)And finally, a single PDF of the whole issue. Ideal for using offline or to make printing easier. Issue 24: Single Document Version (in full).